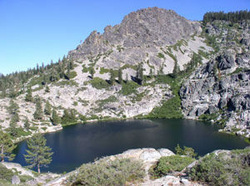 Located in the middle of the Plumas National Forest, U. C. Camp provides an unique opportunity to study the biota, soils, and geology of the Feather River watershed. The UC managed properties are comprised of 120 acres of mixed conifer forest. Tall ponderosa and sugar pines tower over the area, with white fir, Douglas-fir, incense-cedar, and black oak intermixed. The summer temperatures can often reach over 100 degrees Farenheit (38 degrees Celsius). Rainfall averages 41 inches (1,041 mm) per year in Quincy and a high of 78 inches (1,981 mm) per year. Approximately 75 inches (1,900 mm) of precipitation falls as snow each year. UC Forestry Camp can accommodate over 100 people in its 5 dormitories, 4 cabins, numerous "tent frames", and large dining commons. The arrangement of the housing, meeting and eating facilities make it ideal for groups interested in productive discussions. The rustic ambiance and serene forest setting with abundant birds providing a cacophonous aural backdrop and squirrels busily searching for seed sustenance make a relaxing learning environment. "I liked being completely immersed in nature. I like meeting all of the forestry experts/professionals. It was cool seeing how passionate they are." Baker Forest and U. C. Forestry Camp have been in use since 1917. The Camp facility is managed under a Special Use Permit issued by the US Forest Service and has been the learning environment for thousands of Cal foresters. The summer Camp itself is set in a forest museum-piece, with ancient trees, complete with downed logs and attendant wildlife abounding. The site is unparalleled as a location for learning in and about the forest. In February of 1949, the Meadow Valley Lumber Company began to log 32 hectares (80 acres) of what is now Baker Forest. The harvest method was a clearcut. No efforts were made to control the erosion nor to reforest the cutover stand. Many people have looked at Baker Forest and said decidedly that it was an example of what not to do in a timber harvest. Through the efforts of local residents and the Berkeley faculty, the Regents of the University purchased the 32 hectares of cutover land in 1951 to protect the Camp's water supply.